Mrs. Janette Villa Torres, married, with a high school degree and considered a trustworthy person at her place of employment, since she works as a municipal official in downtown Angol (9th Region), never imagined she would manage to photograph what we are showing to our readers. Her intention was to take a photo of the Moon and the planet Venus, which shone in the heavens on 7 November at 21:30 hours. 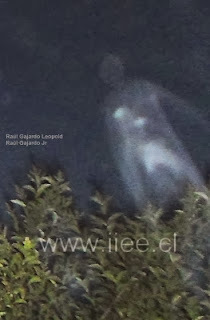 Mrs. Janette was in the back yard of her home and used her 16.7 pixel Samsung digital camera for this purpose. There was nothing particularly unusual about her surroundings. She even remarked to researcher Raul Gajardo Lepold that there is neither public nor private lighting in this part of her house. She did, however, noticed a sort of spark or noise in the flash at the moment the photo was taken, which we mention for purposes of subsequent analyses. The distance separating her from the shrubs appearing in the photo is some four meters, and their height is also close to four meters. At this moment we are conducting some inquiries about whether it could be smoke from the other side of the wall that can be seen in the photo, or if a highly peculiar light effect caused this silhouette. It is only logical that there should be a variety of opinions, more so when the effects of digital photography are still little known. We customarily received a significant number of photos from our readers and we know that photos of "UFOs" and similar subjects are controversial overall. For this reason we have chosen to publish a few that seem curious to us and have a distinct provenance. We are still following the trail of this story. In the meantime, we attach the photo for our readers' consideration, as they will surely have their own opinions about it.